Xu, J., Li, M., and Ni, T. (2015). "Feedstock for bioethanol production from a technological paradigm perspective," BioRes. 10(3), 6285-6304. Because of the impending energy crisis and the environmental problems caused by the excessive use of fossil fuels, biofuels produced from renewable energy biomass have been playing a more significant role in the world. This follows from their obvious environmental and economic advantages. Bioethanol, the most widely used transportation biofuel, is typically derived from plant-based feedstock sources such wheat, sugar beet, corn, straw, and wood. However, the main problem with bioethanol production is that despite the range of feedstock, raw material availability varies considerably from season to season, as there is no systematic framework. By combining technological paradigm theory with literature mining, we found that bioethanol feedstock production development has followed a three-stage trajectory, which is in accordance with the traditional technological paradigm – the S-curve. This new curve can be divided into BFDP (bioethanol feedstock development paradigm) competition, BFDP diffusion, and BFDP shift. Each phase has a different generation of feedstock; first-generation bioethanol in BFDP competition, second-generation bioethanol in BFDP diffusion, and third-generation bioethanol in BFDP shift. Further, based on the technological support, literature mining, and a realistic background, the second-generation bioethanol (mainly lignocellulosic biomass) is expected to continue to be a significant future trend in the world. The new BFDP framework presented in this paper may provide scholars with research ideas for the future. In the 21st century the continual growth in the global economy has led to a commensurate rise in energy consumption and a greater need for fossil fuels, leading to a rapid growth in greenhouse gas emissions, and especially carbon dioxide (CO2). Low carbon societies, therefore, have become the focus of many governments around the world, and this has resulted in a technological revolution focused on increasing energy efficiency and the development and utilization of new renewable energies. Along with other renewable energies such as solar, wind, hydroelectricity, and geothermal power, biomass has been seen as a major renewable and non-fossil fuel source to supplement or replace the use of fossil fuels (Demirba 2001). The United Nations Conference on Environment and Development (UNCED) estimated that about half of the world’s primary energy consumption could be supplied using biomass by 2050 (Kaygusuz 2001) . Because biomass is a renewable and widely distributed energy resource with very low sulfur and nitrogen, its use results in no net release of carbon dioxide (CO2), so is currently the most adaptable form of alternative energy available. The utilization of bioproducts is similar to the uses of traditional fossil energy and could supplement declining fossil fuels. Many countries have initiated extensive biofuel research and development programs so as to develop a sustainable and renewable energy resource that can provide fuel for transportation (Himmel et al. 2007). Biofuels produced from biomass such as plants or organic waste could help to reduce both the world’s dependence on oil and CO2 emissions. These biofuels have the potential to cut CO2 emissions because the plants they are made from use CO2 as they grow. Additionally, biofuels have the potential to deliver at least one-quarter of the world’s projected energy needs of 623 exajoules by 2035 (IEA 2011). This would help to limit global warming, create jobs in rural areas, and improve energy security. Some countries, notably Sweden, Austria, Brazil, and China, have made huge strides in this area and dramatically accelerated their development of biofuel technologies. The types of biofuels include bioethanol, biodiesel, and biogas, to name a few. It is worth noting that today, ethanol is found in almost all of the most popular and widely used gasoline mixes (Kopetz 2013). Various social, economic, environmental, and technical issues related to bioethanol production and utilization have been debated in the popular media and scientific journals. Among these, the “food vs. fuel” issue has been discussed the most in relation to research foci for bioethanol and biofuel production feedstock (Tilman 2006). Although corn-based and sugar-based ethanols are promising substitutes for gasoline in the transportation sector, there are insufficient quantities to replace the one trillion gallons of fossil fuels consumed annually worldwide. Furthermore, the ethical concerns about the use of food as fuel raw materials have encouraged research efforts to be more focused on the potential of inedible feedstock alternatives (Sun and Cheng 2002). Lignocellulosic biomass materials are a substantial renewable substrate for bioethanol production that do not compete with food production or animal feed. 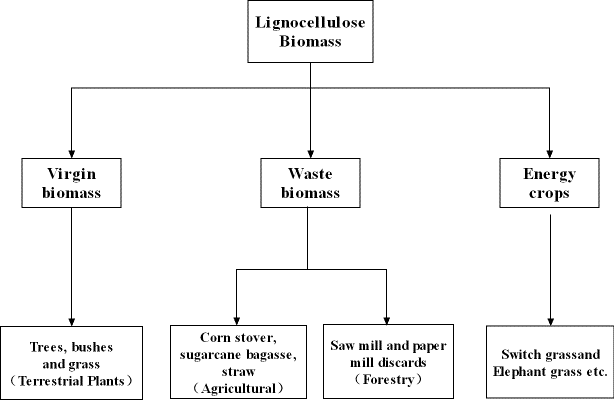 Additionally, lignocellulosic biomass can be supplied on a large-scale basis from different low-cost raw materials such as municipal and industrial waste, wood, and agricultural residue (Cardona and Sánchez 2007). Currently the most promising and abundant cellulosic feedstock derived from plant residues in the U.S., South America, Asia, and Europe are from corn stover, sugarcane bagasse, rice, and wheat straw, respectively (Kim and Dale 2004; Cheng et al. 2008). The discussion regarding different feedstock is complicated, and there is no systematic analytical framework for ranking the importance and development of these feedstock for bioethanol production. Further, much of the research work in related fields lacks integrity and universality. As a result, progress in this area has been slow, with previous achievements partially overlapping. Therefore, there is a need to explore the development of feedstock for bioethanol production, which could then extend to other new and renewable energy feedstock selections. In order to focus on feedstock use for bioethanol production, a data analysis system was created based on Scientometrics (Zheng and Xu 2014). Certain methods have been developed to allow for a comprehensive literature analysis. Data collection, database creation, cluster analysis, and result visualization are the four parts of the data analysis system (DAS) used in this paper. NodeXL, a free, open-source network analysis and visualization software package for Microsoft Excel® (Smith et al. 2009; Hansen et al. 2010), is used to elucidate the changing research foci using keywords from previous research work. From the network graphs generated using NodeXL, it is possible to determine whether the foci trends, as expressed by the keywords, are in accordance with technological paradigm theory. The technological paradigm is a classic concept in innovation and technological change literature and was first defined in Kuhn’s groundbreaking work (Kuhn 1962). Dosi then proposed the technological paradigm and refined the model to solve economic problems with solutions based on natural science principles (Dosi 1982). Similar to the gradual evolutionary process of life, the technological paradigmatic evolution also evolves under the driving forces of market demand and industrial competition (Van den Ende and Dolfsma 2005). Three phases were distinguished to describe technological evolution (Xu et al. 2015; Zheng et al. 2015): the pre-paradigmatic stage, the self-organization stage, and the paradigmatic stage (Willinger and Zuscovitch 1993). This three-stage analysis provides a method for the investigation of past trends as well as being able to predict future possibilities. In this paper, given the close relationship between increasingly advanced technologies and the development of bioethanol production feedstock, the concept of bioethanol feedstock development paradigm (BFDP) is proposed based on the technological paradigm theory. As mentioned before, under market demand and industrial competition forces, as in the technological paradigm, the BFDP evolution has distinct characteristics in each stage, which were verified by the keyword focus trend analysis using the network graphical NodeXL. Based on the paradigm theory and from an examination of the final effect of the changes in each stage in the feedstock evolution paradigm, the evolution can be divided into three stages. After research and the keyword trend analysis, we were able to conclude that the BFDP met the three paradigmatic development law stages and that each stage focused on different bioethanol production feedstock generations: namely competition, diffusion, and shift. The first stage is competition-oriented. In this stage, there are several different early feedstock types. Under developmental influences and market demand, leading feedstocks appear and prevail in the potential market, leading to innovation and further development. This leads to the second stage, diffusion. Finally, due to market demand, the feedstock becomes saturated or some problems may appear, so there is a need for a shift leading to the third stage. This shift in the main BFDP feedstock indicates possible future trends, which is the focus of our discussion. The remainder of this paper is organized as follows. In the section “LITERATURE MINING”, the DAS is created to determine feedstock development from the aspects of keyword distribution in publication years. “THE THREE STAGES OF BFDP” presents the bioethanol feedstock production evolution in three stages by analyzing the keyword foci and the accordance with the theoretical paradigmatic framework. Through the paradigm’s theoretical framework, an overview of the feedstock for bioethanol production is given and a methodology provided for future BFDP and possible new ideas. The evaluation and discussion offers recommendations for future research followed by our final conclusions. Literature mining from published scientific literature is useful for the discovery of key areas and trends (De Bruijn and Martin 2002). After intensive research to determine the relevant research foci, appropriate technology and software, such as popular academic search engines, are used and all relevant scientific papers evaluated (Webster and Watson 2002). In this section, we describe the development of the DAS and the research process and present the visualization results. The organization of the data analysis system (DAS) is shown in Fig. 1. The four necessary modules are on the left of Fig. 1, and the right shows the specific procedures used. The data collection module interrogates the initial literature database and obtains the most relevant information. 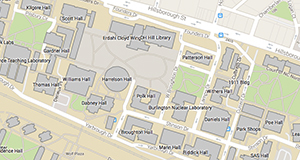 The ISI Web of Science was chosen as the primary database, as it has access to multiple databases and provides researchers, administrators, faculty, and students with quick, powerful access to leading scholarly literature. Using Boolean Logic technology, 120 “(bio) ethanol production feedstock” preliminary related literature were firstly identified using the search strings “(TI =bioethanol production feedstock) OR (TI=ethanol production feedstock)”. When the search was completed, filtering, such as selecting the research field or literature, was done on some reselected articles to identify the specific target. Then, 113 related articles were downloaded directly to NoteExpress. Keywords are an important index term used by authors to provide access to articles which have been published or presented in journals and databases. A key word acts as a representative focus for specific literature. The keywords in the 113 related articles were extracted to create a new database to allow for a feedstock tendency analysis. However, before extraction, keyword pretreatment was conducted using NoteExpress with an easy-to-use interface. When the articles were imported to NoteExpress and duplicates removed, 1017 keyword items were extracted during the time period from 1980 to 2015. NodeXL was designed to facilitate the learning of the concepts and methods in a social network analysis using visualization as its key component, and plays a critical role in cluster analysis and visualization modules. It is a free, open and easy-to-use interactive network visualization and analysis tool that leverages the widely available MS Excel® application as a platform for representing generic graphical data. This tool generally supports multiple social network data providers which import graphical data (nodes and edge lists) into the Excel® spreadsheet. 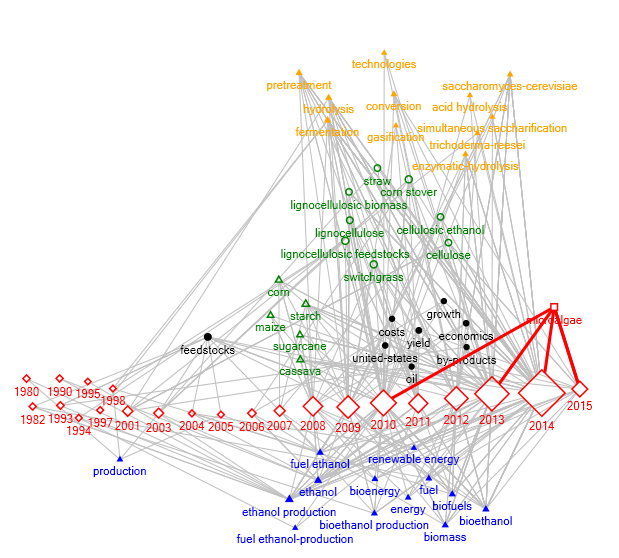 The authors studied how bioethanol feedstock production developed through the publication years. The terms ‘publication year’ and ‘keyword’ were employed to form 1017 edges with 603 vertices. Through this process, the networks built from the keywords and publication years nodes were easily visualized and effectively identified (Scherf et al. 2005). 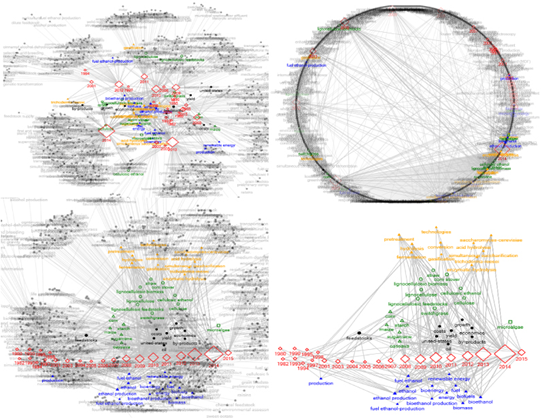 After Graph Metrics, Group Calculation and Graph rearrangements, the results were displayed graphically in a network, as shown in Fig. 2. The two upper level graphs in Fig. 2 are shown using the different Harel-koren Fast Multiscale and Circle layouts. Red and diamond ‘year’ vertices, and green, blue and orange ‘keyword’ vertices are displayed using other shapes, and are selected by the calculation index Degree (Degree>=3). The two graphs below are the same graph at varying times and show the research focus keywords in three time frames: area I (green triangle), area II (green circle), and area III (green square). In Figs. 2 and 3 one can see the keyword trends year by year. Below the ‘year’ vertices, there are several keywords (blue solid triangle vertexes) such as ‘biomass’, ‘energy’, ‘ethanol’, ‘bioethanol’, ‘biofuels’, ‘ethanol production’, and ‘bioethanol production’, which are the main topics in this research, as they are keyword foci across all years. These keywords can be seen to have a consistent focus from 1980 to 2015, (but mainly in last ten years). In Area I (probably from 2005 to 2009), the keywords ‘corn’, ‘maize’, ‘starch’, ‘cassava’ and ‘sugarcane’, amongst others, are the main research foci. 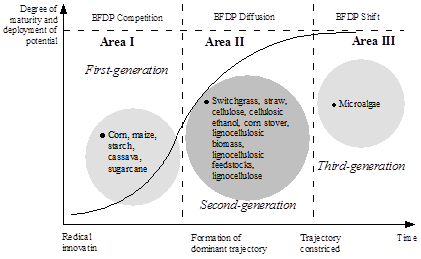 In Area II (probably from 2009 to 2014, the keywords ‘switchgrass’, ‘straw’, ‘cellulose’, ‘cellulosic ethanol’ ,‘corn stover’, ‘lignocellulose’ and ‘lignocellulosic feedstock’ are the main research foci. For the more recent years from 2014 to 2015 (Area III), the only keyword is ‘microalgae’. 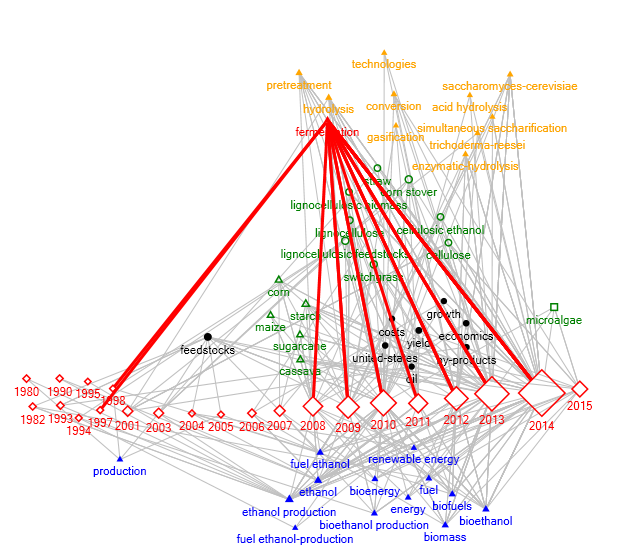 Keywords above the dotted line area (orange solid triangle vertices) show the main technologies used for the bioethanol production such as ‘fermentation’, ‘hydrolysis’, ‘pretreatment’, ‘saccharomyces-cerevisiae’, ‘enzymatic-hydrolysis’, and ‘acid hydrolysis’. All keywords are summarized in Table 1. This paper proposes a novel concept for bioethanol feedstock development paradigm (BFDP) to illustrate the feedstock development evolution, which to the best of our knowledge is a new area of research. The technological paradigm is a long term, continuous process which goes through a complete life cycle from birth, growth, maturity to retirement. There are two further phases which have been distinguished. The pre-paradigmatic phase is characterized by a technical solution selection process and a self-structuring phase which features the industrial learning of new technical solutions (Willinger and Zuscovitch 1993). This paradigmatic phase was added to describe the evolution of the feedstock used for bioethanol production. From the literature mining, we concluded that the feedstock for bioethanol production met the laws of the paradigm and could be summarized in three stages, which are characterized by the different bioethanol generations: competition, diffusion, and shift. These three stages are in accordance with the paradigmatic theoretical framework. With this analysis, we can now combine paradigm theory with bioethanol feedstock production and propose the novel concept of bioethanol feedstock development paradigm (BFDP). The three stages in the BFDP include BFDP competition, BFDP diffusion, and BFDP shift, all of which are discussed in the following. The model shown in Fig. 4 was derived from the well-known S-shaped curve (Ayres 1988). The first stage is competition-oriented, which is defined as the early development of the technological paradigm and involves numerous trajectories and barriers. The diffusion phase is identified as the second stage in which a dominant path prevails in the potential market. Technological shift occurs with technological saturation, which predicts the technological development trends. We estimate that the feedstock for bioethanol production combined with other feedstock sources or technologies will ultimately break through the technical barriers and enter the novel competition phase of the next advanced technical paradigm in a spiraling manner. From Area I, defined as the first stage, one can see that “first-generation bioethanol” is the main feedstock for bioethanol production, which includes corn, maize, starch, cassava, and sugarcane. As shown in Fig. 5, the connecting lines between the ‘year’ and the ‘keyword’ are mainly concentrated in this area. Therefore, from the keyword focus trend analysis and the theory of paradigmatic evolution, “first-generation bioethanol” was the main feedstock in the BFDP competition phase. The demand for first-generation bioethanol, produced mainly from agricultural crops traditionally grown for food and animal feed purposes, has continued to increase significantly over the past few years. These biofuels are ultimately derived from the starch, sugar, animal fats, and vegetable oil that these crops provide. Corn, wheat, maize, sugarcane and other starch-rich crops are commonly used first-generation biofuel feedstock, and bioethanol is produced from these first-generation biofuels through fermentation (Larson 2007; Bioenergy 2008). First-generation bioethanol was rapidly adopted initially as an oxygenate and then as a primary transportation fuel in the United States, Brazil, Canada, and several European nations (Stephen et al. 2012). It has become evident that some “good” first-generation bioethanol sources such as sugarcane ethanol have GHG emission avoidance potential, since they can be produced sustainably, can be cost effective without government support mechanisms, provide useful and valuable coproducts, and, if carefully managed with due regard given to sustainable land use, can support the drive for sustainable development in many developing countries. However, according to the Food and Agriculture Organization (FAO) of the United Nations, food prices have experienced some of the sharpest rises since records began. These increases have been attributed to the growing use of ‘first-generation’ bioethanol derived from the edible parts of food crops such as sugar cane and corn (maize), which is often blended with today’s gasoline (petrol) (Graham-Rowe 2011) . Therefore, the sustainable and economic production of first-generation bioethanol has come under close scrutiny. The potential to meet liquid transport fuel targets being set by governments to help achieve oil-product substitution, economic growth, and climate change mitigation goals is limited by the competition for land and water used for food and fiber production (Fargione et al. 2008; Searchinger et al. 2008), the high production and processing costs needed to compete with petroleum products, which often require government subsidies (Doornbosch and Steenblik 2007), and the widely varying assessments of the net greenhouse gas (GHG) reductions once land-use change is taken into account (OECD 2008) (Sims et al. 2010). As mentioned above, in the evolutionary BFDP competition process, many early feedstock types emerged, which were utilized in the first-generation bioethanol derived from corn, maize, starch, cassava, sugarcane, and other traditional food sources. The production of first-generation bioethanol from mainly traditional food crops has increased rapidly over the past few years in response to concerns about energy supply security, rising oil prices, and climate change. Regardless of the relatively low GHG emissions, even after the technologies have become mature, other issues have arisen, such as unsustainable production relating to deforestation, water use, and land management, the inflation of food commodity prices because of competition for food feedstock crops, and the need for generous government support schemes to remain competitive. Therefore, the perceived environmental benefits of the first-generation bioethanol have recently been brought into question. As a result, hope has been placed on second-generation bioethanol production (Sims et al. 2010). First-generation bioethanol in the BFDP competition stage had significant limitations. Therefore, we can see, according to demand-pull and technology-push theories, market forces and technological innovation will contribute to a new renewable energy framework in the near future. From Area II, defined as second stage, one can see that “second-generation bioethanol” is the main feedstock for bioethanol production, which includes switchgrass, straw, cellulose, corn stover, and lignocellulosic biomass. As shown in Fig. 6, the connecting lines between the ‘year’ and the ‘keyword’ are mainly concentrated in this area. The paradigmatic evolution in the diffusion stage is the most important feature of these common technological innovations (Nagamatsu et al. 2006). Because of the rising food prices and land-use problems of “first-generation bioethanol” in the competition stage, the main feedstock for bioethanol production in the BFDP competition phase needed to encourage the evolution of more suitable feedstock. With an increase in market demand and industrial competition, the BFDP diffusion stage gradually emerged. With all the hotly debated issues surrounding first-generation biofuels, these were deemed unsuitable as a main source of energy. Instead, second-generation biofuels, particularly bioethanol, emerged as the best current option available (Tan et al. 2008). By combining advanced systems and through intensive additional research to eliminate current bottlenecks, second-generation bioethanol could surpass the traditional first-generation bioethanol (Kang et al. 2014), and become dominant in the BFDP diffusion stage. Therefore, from the keyword focus trend analysis and the theory of paradigmatic evolution, “second-generation bioethanol” is maturing and developing as a stable feedstock structure. Second-generation bioethanol, also known as advanced bioethanol, are fuels that can be manufactured from various types of biomass. A major effort has begun to develop alternative ethanol feedstock using crop residues, forest by-products, perennial grasses, and other forms of plant biomass that are collectively termed “lignocellulosics” (Ohlrogge and Stymne 2009). Lignocellulosic biomass can be broadly classified into virgin biomass, waste biomass (corn stover, straw included), and energy crops (switch grass included), as shown in Fig. 7 (Tan et al. 2008). It is composed of carbohydrate polymers (cellulose, hemicellulose) and an aromatic polymer (lignin) (Balat and Balat 2009). Second-generation bioethanol has been developed to overcome the limitations inherent in first-generation bioethanol. It is produced from non-food crops such as wood, organic waste, food crop waste, and specific biomass crops, therefore eliminating the main problems with first-generation bioethanol (Larson 2007). Second-generation bioethanol is more cost competitive in comparison with existing fossil fuels (Londo Deurwaarder and Van Thuijl 2006). Life cycle assessments of second-generation bioethanol have also indicated that they can increase ‘net energy gains’, thus overcoming another of the main first-generation bioethanol limitations. Second-generation bioethanol with lignocellulose material as the main feedstock is a promising alternative to first-generation bioethanol. However, second-generation bioethanol “has its drawbacks”. Production still requires land, so even plants that need minimal input compete with food crops for some resources. Further, first-generation bioethanol has had a head start of more than half a century, but large-scale, second-generation bioethanol production has been estimated to take at least five to ten years (Graham-Rowe 2011). Higher cost and technological limitations are the main contributions. For example, the complexities of saccharification are a major limitation for the conversion of lignocellulosic biomass to ethanol (Chen 2007). In summary, because of the advantages of these non-food crops (mainly lignocellulosic materials), “second-generation bioethanol” plays a significant role in the BFDP diffusion stage. Apart from being abundant and cheap, lignocellulose also has other environmental and productivity advantages over conventional agricultural crops (Tan et al. 2008). Therefore, lignocellulose, the woody part of the plant, also called ‘second-generation’ biofuel, may become the dominant feedstock for bioethanol production. However, because of some technological limitations, more paths need to be developed for the beginning of the next technological paradigm. From Area III, defined as third stage, one can see that “third-generation bioethanol” is the main feedstock for bioethanol production, represented by microalgae. As shown in Fig. 8, the connecting lines between the ‘year’ and the ‘keyword’ are mainly concentrated in this area. The emergence of disruptive technologies (Clayton 1997) and technological limitations (Dalgleish and Foster 1996) are the main reasons why technological paradigms move into the shift phase. Full competition in specific areas leads to disruptive technologies, and technological limitations emerge because of product demand in the market. As we can see, market demand and industrial technological competition are the main reasons for the paradigm shift. The BFDP shift stage occurs because of the need to ensure enough land for food crops and other environmental and societal problems (Thran et al. 2010). A new kind of feedstock was then discovered to achieve sustainability and solve or mitigate the first and second generation bioethanol production problems. As the most promising feedstock for bioethanol in this phase, microalgae could be used and developed, which was supported by our keyword analysis. At present, corn and sugarcane are vetted industrial feedstocks, but “food versus fuel” concerns may preclude their long-term use. Inedible lignocellulosic plant materials are preferable feedstock, but current microbial technologies for the fermentation of the simple sugars in lignocellulose have yet to overcome the cost of the complex processes needed to release these sugars from recalcitrant polysaccharides (Wargacki et al. 2012). Therefore, distinct strategies are required to develop scalable and sustainable nonlignocellulosic biomass resources such as macroalgae for use as the next-generation feedstock. Requiring no arable land, fertilizer, or fresh water resources, macroalgae is already being grown for human consumption, but not as a staple crop (Wargacki 2012). Successful microalgae-production systems are the key to the development of the third bioethanol generation, as they could provide an alternative to one of the most difficult problems of large-scale biomass production deployment ( Lam and Lee 2012; Canadell and Schulze 2014). Further, algae are the fastest growing plants on earth. Depending on how they are processed, algae can be used to produce biodiesel, ethanol, and many other products (Schubert 2006). To summarize, the increasing demands placed on natural resources for fuel and food production require that we explore the use of efficient, sustainable feedstocks such as microalgae or some other plant source yet to be exploited (Enquist-Newman et al. 2014). As feedstock for commercial-scale fuel ethanol production, the mass production of microalgae provides plays a significant role in the BFDP shift stage. As discussed above, when moving into this phase, there are some difficulties to be overcome, so material sources and alternative methods need to be researched and developed. Because of the particularity of microalgae, it is an ideal candidate for the BFDP shift stage as it has the possibility of providing long term and effective sustainability. Biofuels are being mainly promoted in the transportation sector. Increasing the use of biofuels for energy generation is of particular interest nowadays because this would mitigate greenhouse gases, provide energy independence, and could even offer new employment possibilities. Bioethanol is by far the most widely used biofuel for transportation worldwide. Derived from biomass feedstock sources, typically plants such as wheat, sugar beet, corn, straw, and wood, bioethanol is currently made by the large-scale yeast fermentation of sugars that are extracted or prepared from the crops followed by distillation to bioethanol. One major problem with current bioethanol production is the availability of raw materials for the bioethanol production, as these vary considerably from season to season (Balat and Balat 2009). A DAS was proposed, though this method still has several shortcomings; with time, the identified database results change, and each keyword needs to be extracted by hand, which is time-consuming and tedious. However, this study had a fixed period of time, so through literature mining and keyword trends analysis, three stages in the development of feedstock for bioethanol production were found. By combining these results with paradigm theory, a BFDP was proposed, which included BFDP competition (first-generation bioethanol in the first stage), BFDP diffusion (second-generation bioethanol in the second stage), and BFDP shift (third-generation bioethanol in the third stage). Apart from the above three stages, the literature mining produced other results. Keywords above the dotted line area (orange solid triangle vertexes, shown in Fig. 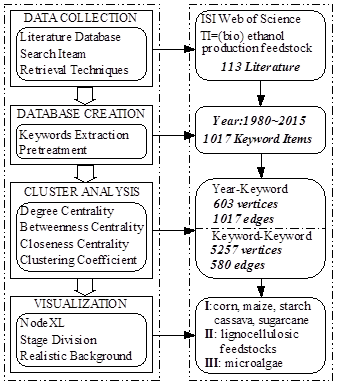 9) , show the main technologies relevant to the production of bioethanol, including ‘fermentation’, ‘hydrolysis’, ‘pretreatment’, ‘saccharomyces-cerevisiae’, ‘enzymatic-hydrolysis’, and ‘acid hydrolysis’ (summarized in Table 1). From the figure, it can be seen that technological development was focused in the last two areas (Area II and Area III), the same periods identified as the research foci, indicating the contributions that have been made in the BFDP diffusion and BFDP shift stages. Bioethanol production processes vary considerably, depending on the raw material involved, but some of the main stages in the process remain the same, even though there are different temperature and pressure conditions and microorganisms are sometimes involved. The stages are hydrolysis (achieved chemically and enzymatically), fermentation, and distillation. When the feedstock is delivered to the ethanol plant, it needs to be carefully stored and conditioned to prevent early fermentation and bacterial contamination. Through pre-treatment, simple sugars are proportionally made available, depending on the type of biomass used and the pre-treatment process. The main steps, for the different feedstock are summarized in Fig. 10, which provides a general production flowsheet for the different bioethanol stages and shows the technological foci for the second and third-generation feedstock. Bioethanol from food sources are known as first-generation bioethanol. Although first-generation bioethanol has the potential to replace fossil fuels as the main energy source, production issues such as food threats and tropical forest destruction will limit the use in the future. Instead, second-generation bioethanol, which utilizes non-edible sources such as lignocellulose biomass to produce the ethanol, has been shown to be more suitable as a source of renewable energy. Microalgae biomass, as a third-generation bioethanol, is a compelling alternative because it can be produced in salt water rather than on arable land, but collection and dewatering is challenging, and the need to grow it in closed systems requires very high capital investments relative to energy crops such as grass or trees. The literature mining indicated that lignocellulose and cellulose still have significant potential. Therefore, second-generation bioethanol is still a viable research focus. Second-generation bioethanol has the potential to be a major source of renewable energy in the world. The replacement of gasoline with cellulosic ethanol could substantially reduce GHGs emissions and significantly mitigate climate change. There is a vast source of biomass feedstock for this environmentally-friendly biofuel throughout the world, so second-generation bioethanol is regarded as the best solution for energy security in the future. 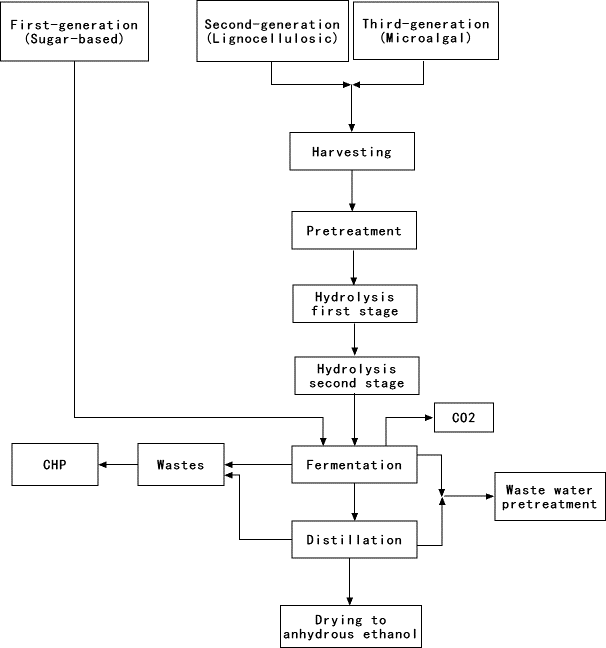 The production of bioethanol from second-generation bioethanol (lignocellulosic feedstock) can be achieved through two very different processing routes. They are: (1) Biochemical – in which enzymes and other micro-organisms are used to convert the cellulose and hemicelluloses components to feedstock sugars prior to their fermentation; (2) Thermo-chemical – where pyrolysis/gasification technologies are used to produce a synthesis gas (CO + H2) from which a wide range of long carbon chain biofuels such as synthetic diesel or aviation fuel can be reformed (Foust et al. 2009). Second-generation, biochemically derived ethanol is generally produced from lignocellulosic materials using a process involving the four primary steps of pre-treatment, hydrolysis to sugars, fermentation, and product/ coproduct recovery. During pre-treatment, the feedstock is subjected to conditions that disrupt the fibrous matrix structure of the material, resulting in the separation of the hemicelluloses from the polymerase cellulose chains and the interwoven lignin that binds them together (Stephen et al. 2012). However, full commercialization of either biochemical or thermo-chemical conversion routes for producing second-generation bioethanol appear to remain some years away despite several decades of research and development and more recent investment in several pilot-scale and demonstration plants in US, Europe and elsewhere. Overall, unless there are significant biochemical or thermo-chemical technical breakthrough which lower production costs and accelerate investment and deployment, it is expected that successful commercialization of second-generation bioethanol and other biofuels will take at least another decade to fully develop. During this period, demonstration and industrial-scale second-generation plants will continue to be improved so that the products become competitive with fossil fuels and first-generation biofuels. Bioethanol applications for aviation, marine and heavy vehicle use also need to be emphasized. After 2020, it is predicted that second-generation bioethanol will be a much more significant player in a global biofuels market, at which point there will be a balance between the first and second-generation technologies (Sims et al. 2010). The potential of lignocellulosic biomass as a viable and sustainable source for bioethanol fermentation has been known for some time. Over the past 80 years, several technologies have been developed that allow this conversion process to occur, but the clear objective now is to make this process cost-competitive in today’s markets. The main reason for the high cost of lignocellulose conversion is the natural resistance of the plant cell walls to microbial and enzymatic deconstruction, collectively known as “biomass recalcitrance.” To achieve sustainable energy production, technologies that overcome the chemical and structural difficulties need to be developed. This means that at present there are still significant technical barriers to successful second-generation bioethanol production in spite of several decades of research and development and the more recent investment in several pilot-scale and demonstration plants in the US, Europe and elsewhere. Further, in this era of fluctuating oil prices and world financial uncertainty, perceived investment risks limit commercial production, even if generous government subsidies are offered. Considerably more investment in research, development, demonstration, and deployment is needed to ensure that the future production of the various biomass feedstock can be undertaken sustainably and that preferred conversion technologies, including those more advanced and those still only at the R&D stage, are identified and assessed as to whether they are economically viable. Therefore the potential of bioethanol requires a long-term view. However, this should not restrict the investment needed to bring these technologies closer to market. International co-operation and collaboration through international organizations needs to be enhanced with both the public and private sectors being involved in the development of the second-generation bioethanol industry. Literature mining from published scientific literature is useful to uncover key areas and trends. Using appropriate technology and software, a data analysis system (DAS) was developed with four necessary modules to determine the relevant research foci. There has not been a paradigmatic framework for bioethanol production feedstock development, though significant research has been conducted on low-carbon economies. 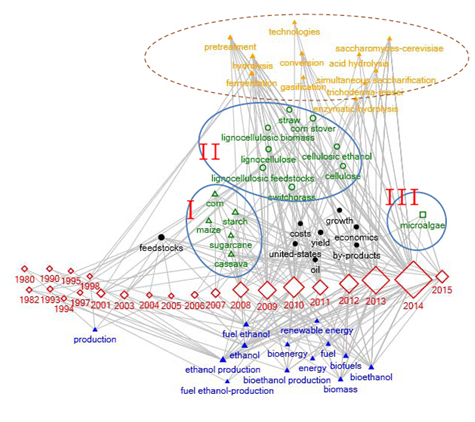 In this paper, in accordance with the technological paradigm theory, using the DAS, keyword focus trends were identified to assess the three distinct stages in biomass technologies. This research was supported by the Major Bidding Program of the National Social Science Foundation of China (Grant No. 12&ZD217). The authors would like to thank the anonymous referees for their insightful comments and suggestions to improve this paper, as well as the Uncertainty Decision-Making Laboratory and Low Carbon Technology and Economy Research Center of Sichuan University for helpful comments and discussion. Bioenergy, IEA. (2008). “From 1st-to 2nd-generation biofuel technologies,” An overview of current industry and RD&D activities, IEA-OECD. Clayton, C. (1997). The Innovators Dilemma: When New Technologies Cause Great Firms to Fail, Harvard Business School Press, Boston, MA. Congress, US. (2005). “Energy policy act of 2005,” Public Law, 109(58), 42. Doornbosch, R., and Steenblik, R. (2007). “Biofuels: Is the cure worse than the disease? ; ” Paper prepared for the Round Table on Sustainable Development, 11-12 September 2007: SG/SO/RT. Graham-Rowe, D. (2011). “Agriculture: Beyond food versus fuel,” Nature 474(7352), S6. Hansen, D., Shneiderman, B., and Smith, M. A. (2010). Analyzing Social Media Networks with NodeXL: Insights from a Connected World, Morgan Kaufmann, Burlington, MA. IEA. (2011). “World energy outlook 2011,” IEA. Kopetz, H. (2013). “Renewable resources: Build a biomass energy market,” Nature 494(7435), 29-31. DOI: 10.1038/494029a. Kuhn, T. (1962). “The structure of scientific revolution,” University of Chicago Press, Chicago. Larson, E. D. (2007). “Sustainable bioenergy: A framework for decision makers,” UN-Energy. Londo, H. M., Deurwaarder, E. P., and Van Thuijl, E. (2006). “Review of EU Biofuels Directive Public consultation exercise – Summary of the responses,” Energy Research Centre of the Netherlands, Amsterdam. Sissine, F. (2007). “Energy Independence and Security Act of 2007: A summary of major provisions.” Library of Congress Washington DC, Congressional Research Service. Webster, J., and Watson, R. T. (2002). “Analyzing the past to prepare for the future: Writing a literature review,” Management Information Systems Quarterly 26(2), 13-23. Willinger, M., and Zuscovitch, E. (1993). “Efficience, irréversibilités et constitution des technologies,” Revue d’Économie Industrielle 65(1), 7-22. Article submitted: August 15, 2015; Peer review completed: April 20, 2015; Revised version received: July 11, 2015; Accepted: July 15, 2015; Published: July 28, 2015.